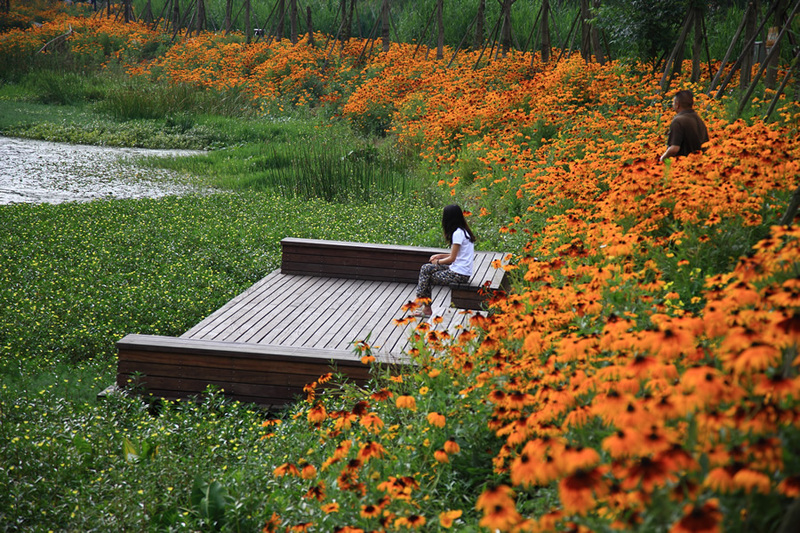 An ecological infrastructure reflects the natural environment rather than something built out of concrete and steel. 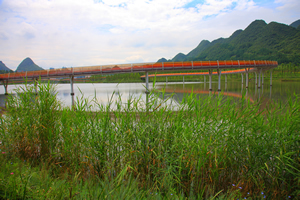 Many of Turenscape's park projects in China let nature take its course. 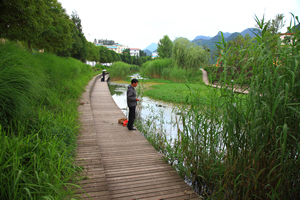 Rather than diverting storm water from a river during the rainy season with pipes or channels, it's captured and filtered in ponds in a terraced wetland system. Areas that flooded historically are allowed to flood again. Nature takes hold, and reeds and flowers spring to life. Birds flock to these wetlands again, and so do the bird watchers, Yu said. Emcee Thomas Fisher, dean of the College of Design at the University of Minnesota, said the definition of geodesign continues to be shaped but offered one of his favorites. "It's a marriage of the incredible spatial power of GIS, geography, and design. It marries the data-rich analytical power of GIS with the creative synthesizing methods of design. GIS helps us understand what is and design what could be." 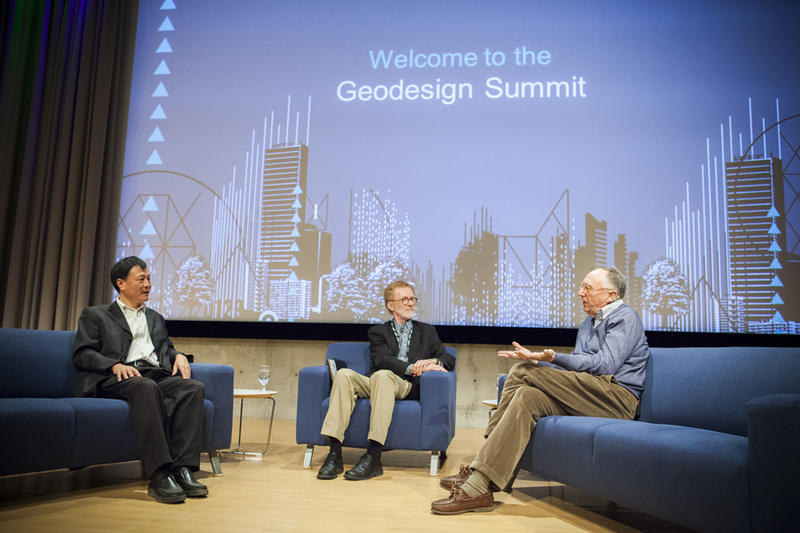 Esri president Jack Dangermond spent about 30 minutes outlining why he thinks using geodesign—whether in urban planning or other fields—will be a linchpin in solving sustainability issues including the changes that population growth is having on land use and the climate. "What is the counterbalance to these trends?" he said. 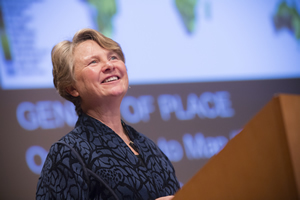 "I think it's in this emerging world of geodesign. Collectively, we need to create a better future." 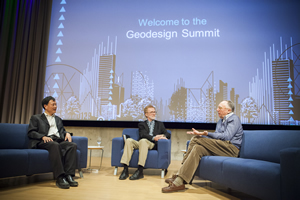 Dangermond said geographic information system (GIS) technology is essential as a foundational technique to geodesign. "GIS provides a platform for the integration of science, providing the practical means for geoempowering design." In a demo, the team showed how it was possible to use ArcGIS Pro to design a green rooftop garden. For example, they used tools in the application to add a glass fence to the perimeter of the roof, access for an elevator, shrubs, and a fountain. "This will be a new tool to do design and blend the 2D and 3D world," Wittner said. Esri technology evangelist Bern Szukalski demonstrated a new browser-based web app called ArcGIS Landscape Planner that's now available in beta in ArcGIS Marketplace. This ArcGIS Online powered app contains sketching and analysis tools and gives designers the ability to bring in landscape and demographic layers and imagery. The app also lets them collaborate together and edit designs. 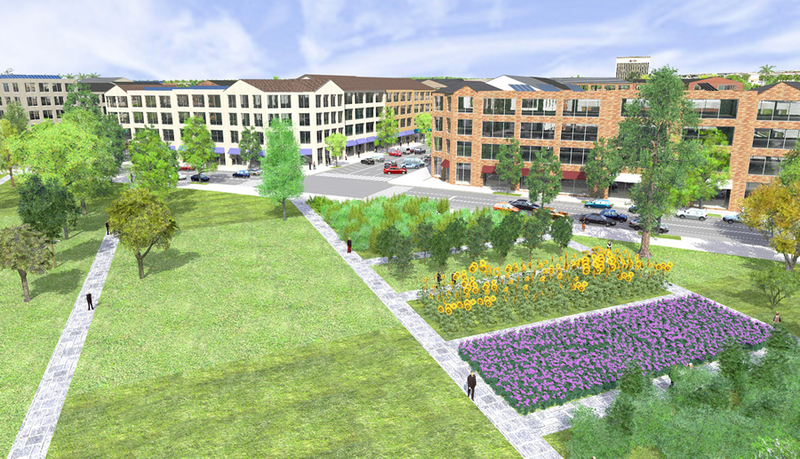 Szukalski used the app's tools to sketch a park and a proposed light rail line in a town. "I think this will be an exciting piece of technology to add to your geodesign portfolio," he said. 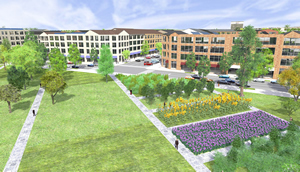 "Landscape Planner helps put all the pieces together to create a true, open geodesign platform." She spoke about how plants and animals evolve and adapt to a changing and often harsh environment, using a 1,500-year-old tree with strong, deep roots and branches that are designed to shed as an example of the resiliency in nature. "That 1,500-year-old tree—it has seen many hurricanes," she said. "Generosity is one of the standards of nature. How does nature create more and more opportunities for life?" "You've been searching for GIS for a long time," said Dangermond. Yu said geodesign using GIS technology is essential to the work of his company, which has completed 1,300 projects in 200 cities including China Town Park in Boston. But he credits his early years working on the commune with a grounding in geography, topology, and soil. The words Tu Ren in Turenscape mean "earth man." "Many of these designs are inspired by my experience on the farm," said Yu. "In the city, you don't know how to grow rice. You don't know how to work with dirt; you don't know how to irrigate." 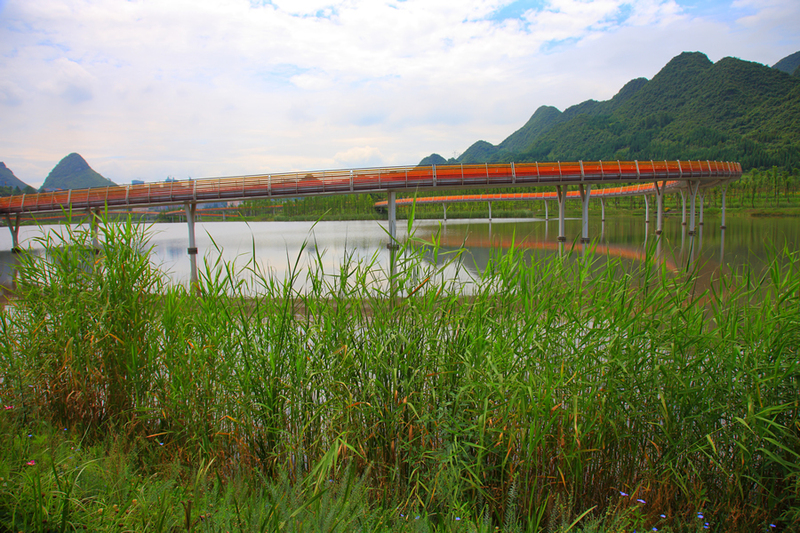 Turenscape used geodesign to develop the Shuicheng River and Minhu Wetland Park project. Concrete embankments along the river were removed, and natural vegetation was planted and allowed to thrive. Storm water is no longer diverted away from the river. Water no longer goes to waste. A once polluted waterway is fishable again. People stroll along walkways that wind around terraced ponds. 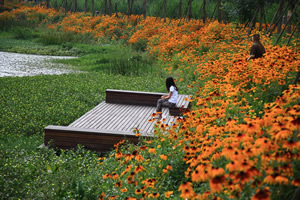 Beautiful orange flowers flourish around the wetland's perimeter. The earth really needs geodesigners to work on its behalf, said Rogers. "More and more, the planet is becoming the client," he said. "And more and more, we can use geodesign to come up with solutions."